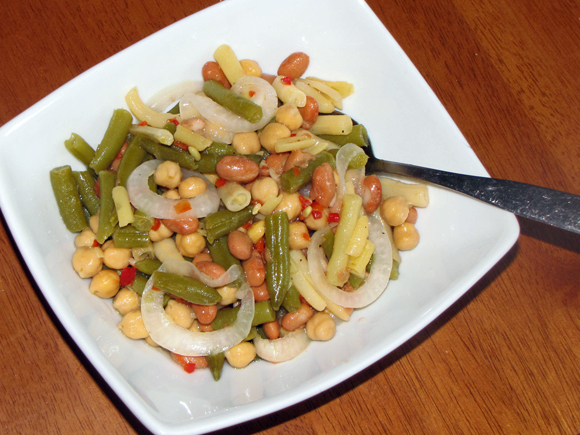 My version takes the popular three bean salad and adds more variety by bringing some chick peas along for the ride. I've used pinto beans or white kidney beans before instead of the standard red kidney beans because I'm just not a fan, but you can definitely use those if that's what you prefer. You can, in fact, throw just about any bean in this! Just make sure it isn't a real soft bean or it might turn mushy after a day or two. I also added some chopped pimento for color and a little flavor boost, but if you don't like them they can easily be left out. This was so good and so easy to make that I think it might be my new 'go-to' side dish. I'm definitely bringing this for next year's big 4th of July party! 2. Drain and rinse all the beans and put them in a large bowl. 3. Add the onions and pimento. 4. Pour the dressing over everything and give a gentle mix so you don't break up the beans. 5. Cover the bowl and chill in the fridge for at least two hours.